President Aquino declares October 6, 2014 as holiday for Eidul Adha (Feast of Sacrifice) | #WalangPasok - Balita Boss! 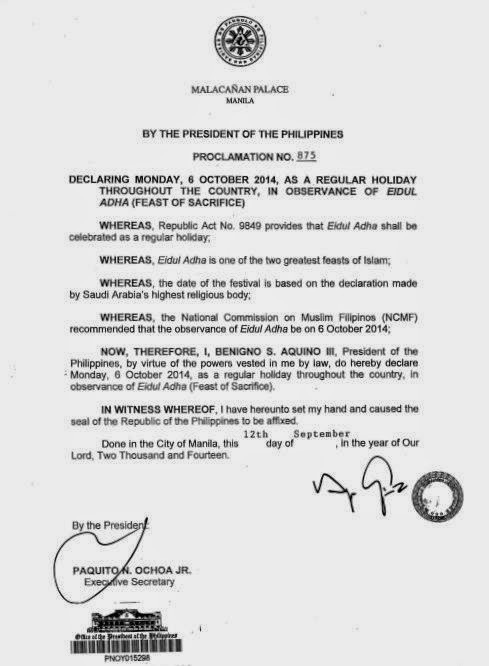 President Benigno 'PNoy' Aquino III on Tuesday has declared October 6, 2014 (Monday) a regular holiday across the country in observance of Eidul Adha. The National Commission on Muslim Filipinos (NCMF) recommended that the observance of Eidul Adha be on 6 October 2014. The declaration was made through Proclamation 875, signed by President Aquino last September 12. Eidul Adha (also known as Eid al-Adha) or Feast of Sacrifice is an Islamic festival to commemorate the willingness of Ibrahim (Abraham) to follow Allah's (God's) command to sacrifice his son Ishmael. Muslims around the world observe this event. This year, Eidul Adha falls on a Monday, giving Filipinos another long weekend.